Many of the satyagrahis were from Belgaum and surrounding places. 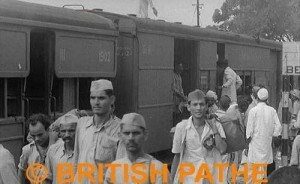 Satygrahis arriving in Belgaum by train on way to border between Goa and India. People with banners and getting down from train. Mass meeting at Banda in progress, where Satygrahis raise anti-Portugal slogans. Demonstrators demand the end of Portuguese rule and return of Goa to India. Meeting in progress (2 shots). Satygrahis marching to the border after the mass meeting carrying banners. Satygrahis at the Goa territory and opposite the Portuguese soldiers opening fire on the unarmed Indian people. Satygrahis crawling forward on the ground, but the volley of fire from the Portuguese soldiers prevent them from obtaining any further progress. LV. Portuguese soldier firing from hut. Indian Satygrahis watching firing. Mass of Satygrahis demonstrating and shouting slogans. thanks for the video…… really nice..
wow, this is great,k I will definitely share it with my mother who was actually injured in Goa during the Satyagraha. Her name was Mandakini Yalgi.